Over the past few years I’ve gotten serious about healthy eating, paying attention to the potentially harmful ingredients all around me from makeup and skincare to plastic food containers. I started buying fewer high-quality clothing and other goods that will last versus lots of fast fashion or disposable items. In general, learning to live (better) with less. Going green can be challenging and overwhelming! Enter this giveaway and I’ll send you a few items to get you started. The more I downsize, the more I realize I don’t need to buy duplicates of many things. It takes a while for me to finish the first thing and then my house is crowded with unopened, brand new, but completely unused things. So I’m passing some of these great products on to one lucky winner! I really like these toothbrushes because they are super comfortable to hold and comfortable on your teeth and gums. I’ve professed my love many times before. They also offer a cool program called “Gimme 5” where you can send in #5 plastic. They also offer a takeback program specifically for their toothbrushes that “closes the loop” on their brushes and offers you a gift card to their store. 6 toothbrushes = $6 to spend on other Preserve items. You can mail them in or find a drop off location. You’ll actually get more than three sponges – In this giveaway you will get: 1 Lavendar Mist Facial Pad Multi-Pack (for face), 1 Lavender Mist Exfoliating Bar (for body), and 1 Active Unscented 3 Pack Sponges (great for camping or outdoor sports). I’ve talked about this brand before as one of my go-to kitchen sponges. The soap-infused sponges are made from non-toxic foam and biodegradable cleanser. Every Pura Naturals sponge, bar, and facial pad is handmade in their USA-based manufacturing facility. 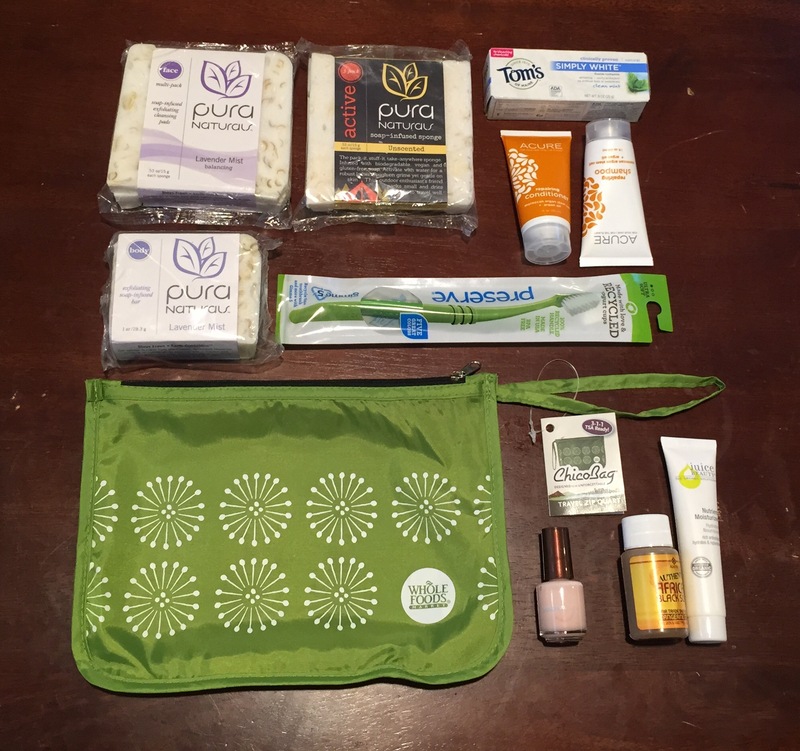 This is a great little travel bag and set of products – I have one too and use it all the time. The green ChicoBag is patterned on one side as you can see in the photo and it’s clear on the other side so it’s TSA complaint! Unlike those quart-sized plastic baggies you always use, this one is reusable over and over again. It comes with travel-sized (but generous) versions of the following: Acure Moroccan Argan Oil Stem Cell Shampoo + the matching Conditioner, Tom’s of Maine Simply White Toothpaste, Juice Beauty Nutrient Moisturizer, Alaffia Authentic African Black Soap and Mineral Fusion Mini Nail Polish in Blushing Crystal. Step one: Follow me on Instagram*! Step two: Fill the form below so I know you did (and I can contact you if you win)! … that’s it! Good luck! Contest ends REALLY SOON – January 4, 2016 at 11:59pm EST. Winner will be notified on January 5, 2016! *If you don’t have an Instagram account, don’t worry! There will be other giveaways in 2016 that don’t require an account. Stay tuned.